Commitment. The most important aspect of your training is consistency. You’re more likely to get out for your run if you feel you’ve committed to others who expect you to be there. Even if you run in a group, be accountable to one or two specific individuals for each run. The thought of letting someone else down will make it hard to sleep in or skip your run. Camaraderie. Sometimes, when we run alone, time can just drag and our runs seem to take forever. The camaraderie and distraction of being with others can really help. As your runs become longer, the “we’re in this together” feeling becomes even more important. Safety. We’ve all heard that there’s safety in numbers, and it’s true for runners, too. If someone gets hurt, others are there to get help. Larger groups ward off wildlife visitors or humans up to no good. Groups of runners are more likely to spot trail hazards – like obstacles or holes in the road – and warn others. Lastly, your group is less likely to get lost while together, but if you do, you have each other to develop a plan to get back home. Motivation. Running with others makes it hard to quit mid-run. You’re more likely to finish and reach your goals in a group. Being with others also makes you feel that if they can do it, so can you. Performance. A little friendly rivalry or competition can be a good thing and improve your running performance. Just make sure you don’t make every run a competition. Remember to keep your easy days easy. Networking. 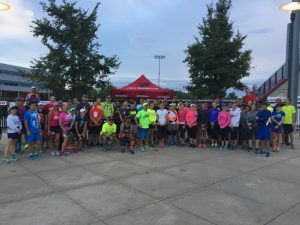 You never know whom you’ll meet in your running group; they just might end up being contacts and confidants that will help you with other personal, career or philanthropic goals. Social/Friendships. Some of my best friends over the years have been my running friends. Long runs are a great opportunity to really open up with someone and get to know them on a deeper level. I have running friends who retired from running years ago, but I’m still in close contact with them. Running friends are friends for life!